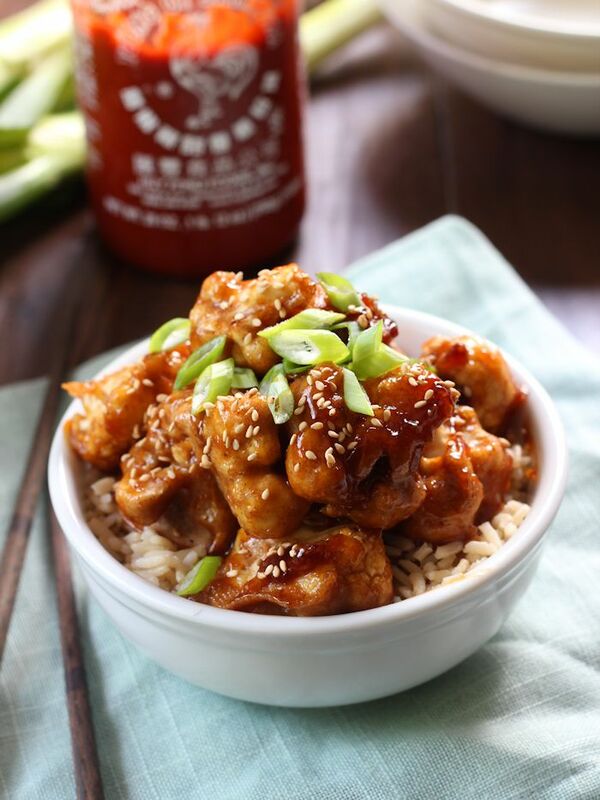 Thanks for the recipe, we made your vegan STICKY SESAME CAULIFLOWER creation and enjoyed it. One modification worth mentioning, we substituted brown rice for Quinoa to add some protein and it worked out great! So glad you liked it! Quinoa sounds like a great sub for the rice – I’ve tried it myself in some similar recipes. Thanks for sharing! This has some bizarro ingredients that do not seem like they’d work together, so of course I’m going to try it. If it tastes as good as it looks, then you’re my new hero. I made it they do work! Delicious ! 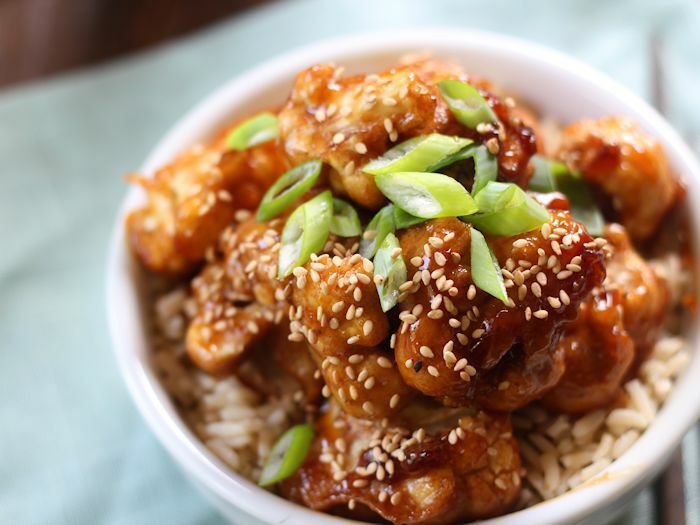 This reminds me of a much healthier version of sticky honey and sesame chicken (which I always order for takeout).. definitely need to test out the recipe. Love how delicious and saucy the cauliflower is & that its baked! I am definitely going to give this a go in the coming week – it’s in the planner. I used to order an amazing Indo-Chinese sweet and sour cauliflower starter from a much-beloved Indian restaurant in my hometown, which was deep fried and tasted so eerily like chicken that I refused to eat it the first time I ordered it. I have always wanted to mimic that lovely tangy, delicious cauliflower goodness at home without the deep fat fryer. This looks like my chance. If it works out the first time, I might experiment and test it out using chickpea (gram) flour as I don’t keep WW flour around in my student block. Awesome! I hope you like it as much as I did! I’m thinking chickpea flour will work. I’ve seen similar recipes in the past that use chickpea flour, and even considered working with it for this recipe, but ended up going with whole wheat, figuring more people would have it on hand. Please let me know how it works if you try it! This turns out to be the recipe I didn’t know I was missing. ; p Mine turned out much darker because all I had on hand was dark soy so I only used 1/2 the amount but it was so good. In fact, I felt a bit guilty because hubby had to work late and grabbed something on the way home but I couldn’t resist telling him what a good dinner he had missed. Is that bad? I made this the other night, it tasted great but I didn’t get the cauliflower right….I think its because I used plain flour rather than whole wheat..The batter was too runny so the coating just pooled at the base of the pieces…Should i change the quantity of flour or should i just go buy some whole wheat flour? This seriosuly looks epic! I love asian food and I have seen flavored cauliflower so many places, I must try to make it one day soon! Thanks for the inspiration! I had the same issue with the batter, it pooled in the pan even though I tried to shake off all the excess. It was still good but only one side of the cauliflower had the batter. Please let me know what I did wrong! (followed recipe and used whole wheat flour) Thanks sooo much! Sorry it didn’t stick, but glad to hear you still enjoyed it! Next time you can try stirring in an extra tablespoon or two of flour until the batter seems to hold. It should be pretty thick. I’ve also seen similar recipes where you place the cauliflower right on the oven rack with a pan below it to catch drips, so you could try that too. what are the macros of this dish per serving? Made this last night, it was OMG delicious. Hubby is still carnivorous and loved it too. He said he didn’t even miss the chicken. Thanks for sharing! So happy to hear it! Thanks for letting me know!! Can honey be substituted for maple syrup? Do you think it would be the same ratio? I think that would be fine, and I’d use the same ratio. I’m afraid this didn’t work at all. The “batter” was too runny, the cauliflower (despite cooking longer than the recipe says) never got crisp, and then (once the the sauce was on it) it never got sticky. The batter basically turned into a layer of bread that then got stuck all over the pan. And it tasted bad too. These are the exact same problems that I had. It still tastes good but it’s just soggy cauliflower in a sweet sauce. The batter went everywhere despite my oiling the pans and what little bit of crispy it did get just died once the sauce was added. The sauce also never thickened. Same problem here! I had high hopes for this dish and the pic looked so good but I have no idea how she got the cauliflower to turn out like it did in her pic. I followed the recipe exactly and wound up with somewhat gummy battered califlower that stuck to the pan (despite the oil in the batter and me spraying the pan) and after the sauce had sat on it not more than 5 minutes, it was soggy. Definitely not good for leftovers! Sorry it didn’t work out! I’ve made this a few times with no problem. I’m thinking that since this is a high temperature, short bake time recipe it will be very sensitive to variations in oven temperature, so if you’re oven is off by a few degrees or not completely preheated that could be the issue. That’s my best guess, but I’ll be testing this out in the coming weeks with a few variables to see if I can come up with what’s going wrong for some people. This is exactly what happened to mine. Except that I thought it tasted delicious and I at so much I got really stuffed. Loved the taste, but want to fix the texture. I only used one cup of almond milk since the batter seemed liquid enough to coat the cauliflower. I didn’t use any vegetable oil, instead I only put 1 teaspoon of sesame oil in the sauce and used the other teaspoon to coat the cauliflower after it had baked for 10 minutes and before putting it in again. That’s all I changed, and the cauliflower got nice and crispy, even sizzling after the second go in the oven. However, I had the same problem as the other commenters with the sauce. When I saw how runny it was in the pan after simmering for 10 minutes and sitting for a few minutes with the first tablespoon of cornstarch, I added another tablespoon of cornstarch. I let it sit some more and it was still completely watery. I poured it over the cauliflower, put it in the oven for ~10 minutes and crossed my fingers, but it still came out runny, even after letting it sit again for ~5 minutes. I had to strain the cauliflower out of it. It was still delicious and crunchy, though, but I regret wasting that much rice vinegar, maple syrup and soy sauce, because you could get away with making only half the amount of sauce (and that stuff is expensive). How long is the sauce supposed to sit off the fire before putting it on the cauliflower? I think that should be added to the instructions, because in my case the sauce was done simmering at the same time as the cauliflower was done cooking for the second time, so it didn’t have inherent time to sit. Anyway, I will definitely make this again, but with only half the sauce and letting it sit longer. It’s really good. This recipe will go into our rotation. 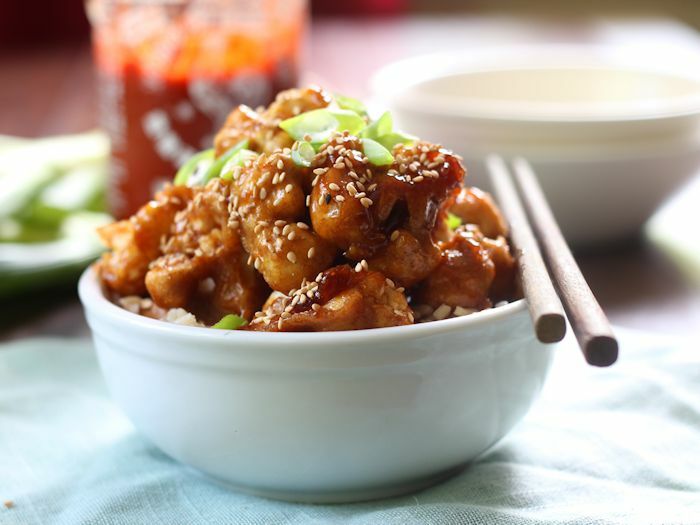 For a vegetarian that sometimes misses meat this is a good replacement for sesame chicken. Thanks! I’m so glad to hear that! Thanks so much Ken!! Awesome! I love hemp seeds and they sound like a lovely addition. Thanks Maria! I made this recipe the other day and have to agree with the other commenters who said the breading became soggy once the sauce was added. While it was still delicous, the texture wasn’t the greatest. In the future, I’ll most likely broil the cauliflower until crispy and toss in the sauce instead. I will say though, the sauce was PHENOMENAL! I could eat the sauce by itself. I made this last night. It was a hit here. next time i might try it with brown sugar instead of maple syrup just because its a little cheaper. I also added broccoli to this and it was still very tasty. I can see this turning out well with a chicken like setian. My batter stuck to my pan what type of pan needs to be used? You should be okay with a regular old pan if you’ve got it well oiled. If you’re still having trouble you could try something nonstick like a cast iron skillet, or you could lay down a sheet of parchment inside your pan. My maple syrup bill has gone up considerably since stumbling upon this fantastically delicious recipe. We are enjoying it so much, we’ve made it a good 3-4 times in the last 2 weeks. Thanks! Sounds like a hit. :) Glad you’re enjoying it and sorry about the maple syrup bill – that stuff can be pricey! Can I use unsweetened cashew milk? Its what I have on hand. Thanks! This reminds me of honey-chili cauliflower or mushrooms which is usually served as an appetizer or starter in many INDO-CHINESE restaurants in India. Only thing that i don’t like about that dish is frying part. I am definitely going to try this recipe in your way. Thanks for sharing. Love this recipe and all the healthy changes you made to it! Now I am in the mood for a plate of these sesame cauliflowers…can it also be made with frozen cauliflower? Hi! I can’t find sriracha, should I use other sauce such as Tabasco or Frank’s RedHot Original? I don’t drink nut milk, but considering it’s mostly water, could I just use water instead? That was absolutely delicious, thank you so much for the recipe! You’re so welcome! Glad you enjoyed it!! This looks SO good girl! I can’t wait to try this. I’ve been meaning to tell you I really like your blog layout. Cheers! Just tried it yesterday and it was sooooooooo tasty!!!!!!! Only i did`t need the cornstarch, it was thick enough without :-) Thanks for the great recipe! Glad you liked it! Thanks Johanna! I made this the other night and while the sauce turned out really well, the cauliflower wasn’t great. The batter was really thick and despite cooking the cauliflower at a slightly higher temperature and for longer than suggested, the crust wasn’t super crispy and then tossing it with the sauce made it even soggier. I would make the sauce again but I would try doing the cauliflower differently. Thanks for sharing! Glad you enjoyed it! Thanks Sue! Thanks so much for this recipe! Ive made this for my mom’s boyfriends birthday tonight and everyone loved it!! At the end I was afraid the sauce wouldn’t become sticky as it was reaaaallly liquid…! but it became just fine; I stirred the cauliflowers with the sauce a lot and it became just like in your pictures! so yummy! 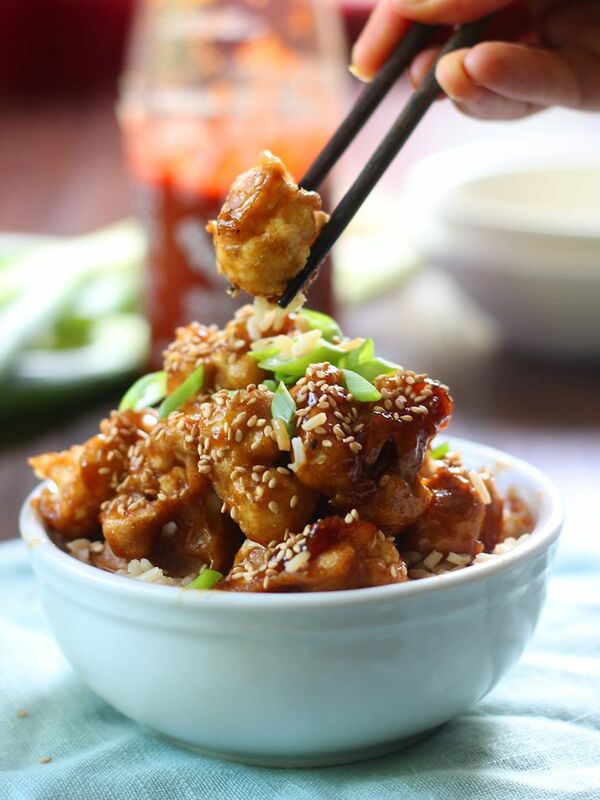 This reminds me of a much healthier version of sticky honey and also sesame chicken. most definitely should evaluate out the dish. Love exactly how delicious as well as saucy the cauliflower is & that its baked! That’s exactly what I was going for! Thanks Emma! Hey! Could I use tofu instead? The sauce would be delicious on tofu, but you might be better off using a different cooking method for the tofu itself. Try rolling it in cornstarch and pan-frying – this recipe can give you some guidance. Enjoy! One of my favorite go-to recipes!!! I use tofu instead of cauliflower, and it comes out perfectly. Oh nice! Glad to hear it!! Very welcome! Glad you enjoyed it!! Just had this delicious meal for dinner. Here are some suggestions…I used a cast iron skillet for cauliflower. After adding cornstarch to sauce I cooked till thickened. About 3 minutes. I left finished dish in oven till sticky and crispy. Used a metal spoon to scrape all crunchy bits off bottom when serving. Sauce and bottom crispies so yummy!!! Thanks for recipe! I used garbanzo bean flour to make it gluten free and it was delicious. My Silat mat was a lifesaver. Delicious!! Awesome! Glad it worked out! I made this the lazy way. I just threw the chopped cauliflower in my cast iron skillet and browned it in a little coconut oil, then added the sauce and stirred in a little gluten-free flour. I skipped the milk and coating the cauliflower. It was amazing and tasted just like the real deal! My whole family loved it!! I’ll have to give that a try next time I’m looking for a shortcut! I’m glad it worked out, and glad everyone enjoyed it! I have a question-Could you substitute Honey for Maple Syrup? Halfed the recipe and made it for two! Used white flour because it’s all I had and it was absolutely delicious! I’m glad you enjoyed it! Thanks Kelsey!! Omg! Omg! These look so unbelievably delicious, definitely going to try this recipe out. I made this and it came out amazingly delicious! Wow I will be making this again and again. It’s one of my favorite vegan recipes. I used Spelt flour instead and also used grapeseed oil instead of sesame oil since I didn’t have any sesame oil on hand and it still came out insanely good. Very happy I found this recipe. I’m so happy you found it too, and really glad you enjoyed it!! Thanks so much Lee Ann! This was absolutely delicious!!! Will definitely be making it again! Thank you! I’m so glad to hear that!! Thanks Lyndi! Ok…something went really wrong for me. First, I’d like to say that it was delicious. Love a good soy-ginger-garlic sauce. Such a great combo. But not only did my dish not look at all like your picture, my cauliflower was mushy instead of crispy. I followed the recipe to the letter. My batter came out very thin and didn’t coat my pieces well. My sauce came out good except that it never got any thicker and when I poured it over the cauliflower, it just dripped over it and a lot of it ended up in the pan. My end result was mush but very tasty florets. I have no idea why everything was so watery. I followed the recipe to the letter. I’m sorry to hear that! The only thing I can think of is to check your oven temperature. It needs to be super hot for the sauce to thicken up, and if it’s a few degrees too cool I could see it not working. I love making (and eating!) a fried version of this so was excited to try a baked variation. However, like many other commenters the cauliflower just wouldn’t crisp up even though I gave it a good bit of extra time, the batter pooled on the sheet despite adding extra corn flour, and the sauce wouldn’t thicken even after 10 minutes longer on the hob. I ended up with a tasty enough dish but no trace of batter, no crunch, and no stickiness! Going to stick with fried when I want to eat this dish I guess! Just made the recipie above and feel really satisfied by the result. I use to be very cautious with internet recipies cause most of them are not correct. Did not happen with this one though! Thanks for sharing this exotic touch to my cook book!! I’m so glad you liked it!! Thanks Sophia! I made this once and my kids and I loved it!! Making for a second time but I didn’t realize I was out of rice vinegar :-( what can I substitute? I think you could get away with another type of vinegar – white, apple cider or red wine should work! Yay!! I’m so glad you enjoyed it! And I LOVE the idea of using broccoli – I might try that out myself next time. Thanks Sarah! Good luck and I hope you enjoy it! !